MCHENRY, Ill. – April 8, 2019 – Raybestos® has added virtual kits to its online catalog, giving distributors the flexibility to go to market to their installer customers with a pad and rotor kit for popular applications. Distributors still purchase the specific brake pad and rotor part numbers as they do today, but now have the opportunity to take advantage of this updated cataloging feature. The virtual kits are cataloged in both the Element3™ and R-Line families. Element3 virtual kits are for everyday drivers who want exceptional performance with enhanced product features. 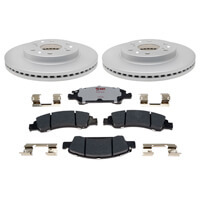 They include Element3 brake pads with superior friction formulations paired with an Element3 coated rotor. R-Line kits are for daily drivers who need dependable performance. They feature traditional semi-metallic or ceramic formulations paired with an R-Line professional grade rotor that matches OE vane configuration, weight and design. Typically, when vehicles come into a shop with a low or spongy brake pedal, most mechanics assume the problem lies in the hydraulic system. It may be a faulty master cylinder, a leak in the brake lines or a bad caliper. However, the cause of a low brake pedal doesn't always lie in the hydraulic system. In this video, we show you how a faulty or loose wheel bearing can lead to a low brake pedal. We recently had a vehicle come into our shop with a low brake pedal. Another shop diagnosed the problem as a faulty master cylinder. However, after replacing the master cylinder, the low brake pedal remained. We assumed that there was a problem in the hydraulics system somewhere. We got the car in the air and were preparing to perform an isolation/line lock test. Before we started the test, we wanted to run through our brake inspection checklist. As part of that checklist, we checked the play in the wheel bearing. We found significant play in the bearing. Brake rotors are held in alignment by wheel bearings. If you have a faulty or loose wheel bearing, the rotor will wobble on its axis. This will cause the rotor to push the caliper piston into its bore. Now, when you hit the brake pedal, the piston has to travel farther than normal to apply the brakes. This causes a low or spongy brake pedal. In summary, don't always assume that the cause of a low brake pedal lies in the hydraulic system. Always run through your normal brake inspection to determine if there's another explanation.